Enhance the protection and increase the functionality of your 9 or 10.5 tablet with this cover. With our clean, minimalistic design, you get all the protection you need, without losing access to buttons or jacks. Serves as a low angle prop for great comfort in typing mode, or as an upright stand to sit back and watch movies and video clips. 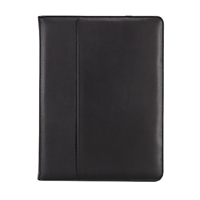 Fits most 9 and 10.5 tablets Stylish synthetic black leather design Taking a cue from our patented SG Bumper Technology, our SG Grip System securely protects all four corners of your tablet, and let you change it out in seconds. Adjustable corners fit seamlessly with a wide variety of tablets Portfolio style for 360-degree tablet protection Smooth, non-scratch interior SG Grip System Kickstand WORKS WITH Samsung, Nexus, Acer, Asus HP, Lenovo, Sony, Kindle. 8.35" x 0.98" x 10.63"